This Dex has definitely seen better days and this morning was more unstuck then stuck to me. Tomorrow will be a fresh start with a new sensor but for today, I give you my version of Blue Friday. My co-worker just informed me today’s design is her favorite, so far. Obviously this only encourages me to top my own Dex decorating ways. Yes, you are correct, those are rhinestone centers. Keeping it classy. Please note: I’ve never met a sequin or piece of glitter I didn’t like. 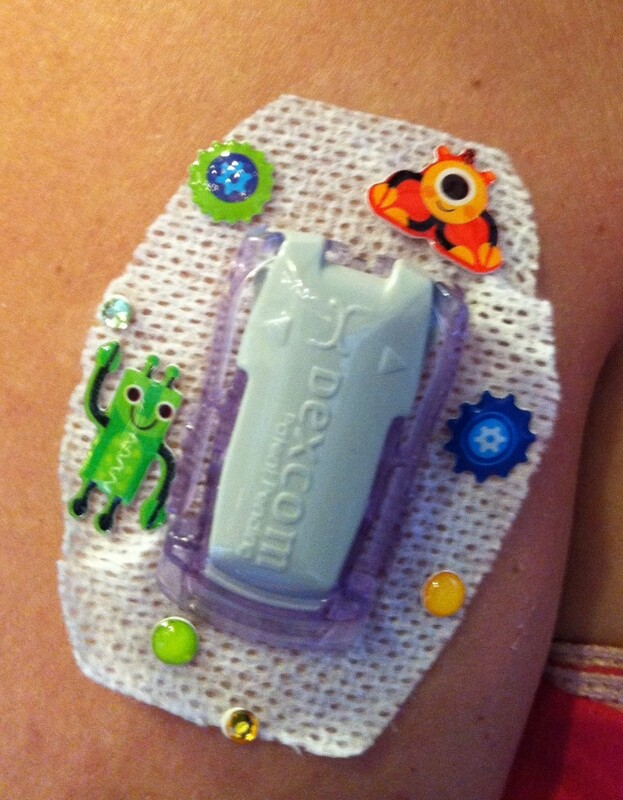 You MAY have noticed, I have gotten VERY into decorating my Dexcom. When it’s starting to look fuzzy around the edges, I go into fancify mode (yeah I made that up). IV300 works best on top of the stickers (keeps ’em on) and I need it anyway to help my Dex last a few more days. Yep, that’s right. Pink ruffle dress and oh, wait, what’s that there? Looks like a Dexcom site. But there’s something on it. A little glittery? A little shiny? So yep, here are some robots, you know, to go with my robot parts (of course). I am only responding to the name Mrs. Roboto today (or until it’s time for some new decorations). I have entirely too much fun with this. This morning I stopped by my office building’s cafe to grab some breakfast, my standard, multigrain toast and a hard-boiled egg. 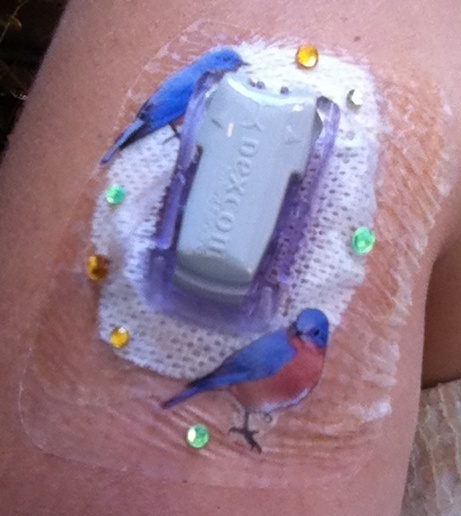 Today I am wearing a black sleeveless dress and amazingly, (see pic from yesterday’s post), my fauna decorated Dexcom still looks perky after a shower (shocking, I figured it would dissolve). The Dex in my arm doesn’t seem to ever blend-in but the contrast today seems more significant. The woman behind me in line asked, “What’s that on your arm?”. Me: “Oh I’m diabetic and it’s a continuous glucose monitor so it shows me blood sugar trends” (pointed at Dex receiver on top of my phone on counter). 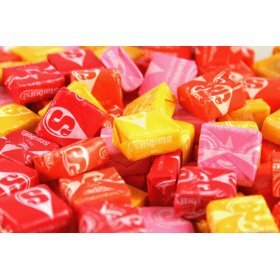 Lady: “Oh my friend has diabetes but he has a…. ummm…” (pointing to her hip). 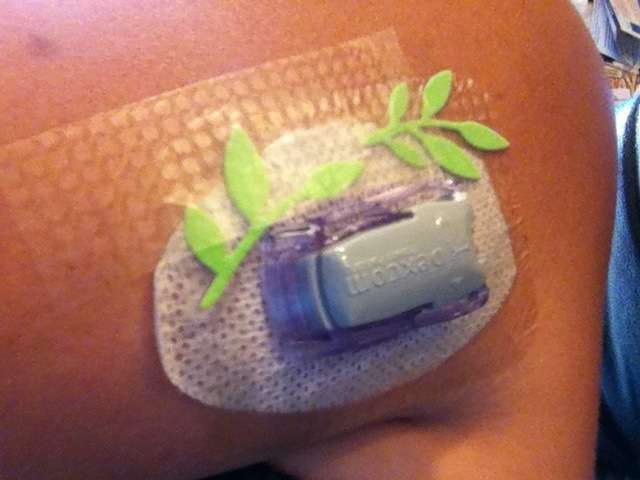 Me: “Oh an insulin pump.” I grab my pump thru my dress, attached to underwear so she can see the boxy shape on my hip. Lady: (looking confused). “Oh his pump takes care of everything, he doesn’t need anything like that” (pointing to my arm). I’ve decided I MUST find this theater loving man with a pump that takes care of EVERYTHING. This week has been filled with incredible BG frustration (and yes I am still taking +10% to +20% temp basal & multiple corrections per day with mild success). I got in the elevator and felt angry. In my moment of anger and frustration, I thought how much I would like to smack the man with his pump that takes care of everything. He has done a disservice to me and many others like me, letting this woman roam the earth thinking that his pump is a cure and its biggest frustration is that it sets off a metal detector sometimes, you know, at the theater. Dexcom site will be changed later today. Decided to ride this one out with some American flair! Ok the title is a stretch. Like a HUGE stretch. I wrote the list below as I struggled with the JDRF walk letter I STILL have not written (11 years organizing a walk team and this is the furthest behind I have ever been). There are a bunch of other things for this list but for now, this will do. I am not scared of hospitals. Nope, not me. 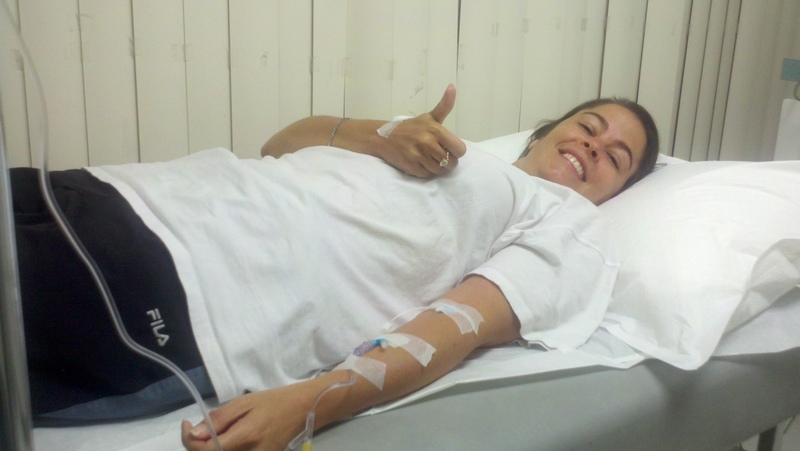 When a friend or family member is ill or hospitalized, any fear I have, I can shake it off. I’ve been in scary hospital situations myself. I know what a helpless feeling it is. I will move mountains to alleviate that fear for someone else. I’m like a candy-striper gone a little rogue. I know the power of being pleasant at a hospital. Saying, “thank you” works wonders. I appreciate my life, greatly. I know just how incredibly fortunate I am. Insulin was discovered only 90 years ago (crazy right? Check out Breakthough). Many huge insulin refinements have happened within my own life time (also my college application essay was about how I’m a drug addict… an Insulin Junky… I got into a bunch of colleges. Maybe it was a good point?). I know how to read all sorts of medical tests without any medical training. Yes, that’s right. One example, I have had enough lasering within my eyes, and reviewed enough photos of my eye interior, to have established an intimate relationship with my peepers. My doctors even give me interior eye photos to take home with me. Eye pics? Yep, cool. I (almost) always have snacks with me (if we ignore that whole Gettin’ Low incident). I’m the friend when you need a sugar-rush. My refrigerator is 3 deep in juice boxes. You need juice, I’m your lady. I even keep a juice box next to my bed. If you are interested in developing cavities, stop by. Today’s purse assortment includes glucose tabs and Starburst. I auditioned for a TV commercial. Yep. 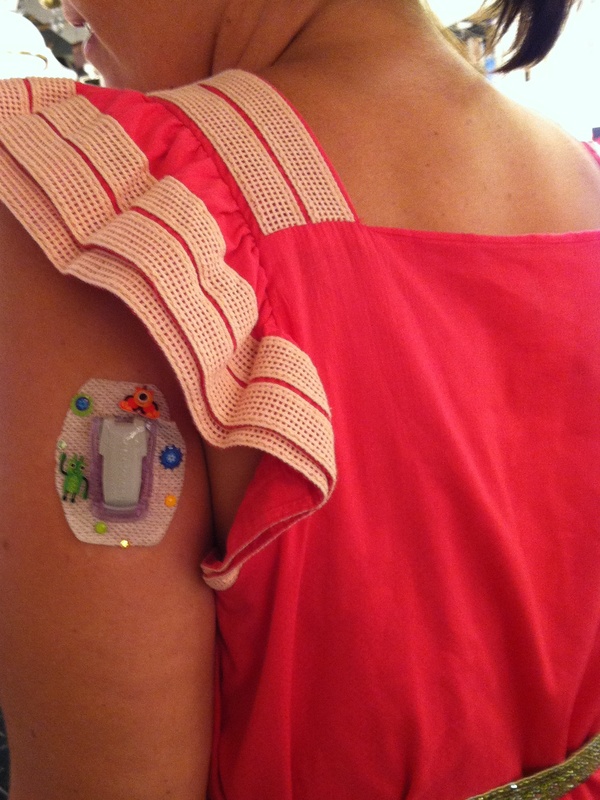 I auditioned for a commercial for the manufacturer of my insulin pump. They only wanted “pumpers” who used their product. I LOVE my pump and it sounded like an adventure. The whole thing was a complete disaster, I couldn’t remember the lines, and I got a case of the giggles so bad I am pretty sure I almost peed my pants. They gave me a zillion tries. The lines were ridiculous and the complete opposite of how I would ever naturally speak but it provided us with hours of laughter and teasing. M was there, you can ask him. 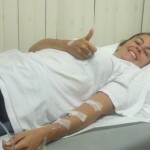 I never would have had the opportunity and the fun story to tell, if I weren’t diabetic. I am good at sucking-up and then fighting with health insurance companies. I will pour on the charm, and when/if that doesn’t work, yes, I will fight. I will fight and fight. Don’t get me wrong, I play fair, but don’t deny me my rights because I will pull out ninja moves you didn’t even know existed. I exercise. I may slack off a bit in the gym from time to time but I have an incentive to work-out. I have to. I need to keep my diabetic heart working. A working heart is a loving heart and after all the fighting (see #6), I need to keep the ticker ticking. I know the carb count in tons of foods other people will never know. I like a lot of weird foods. My current new fave is Lebanese food. There’s a dish that’s brussel sprouts, grapes, fig jam, walnuts, and mint yogurt. I’m working on the carb count on that one. It’s heaven. Heaven needs a carb count. I have overcome my fear of peeing my pants. I was very ill on a flight (That story does still turn my stomach). 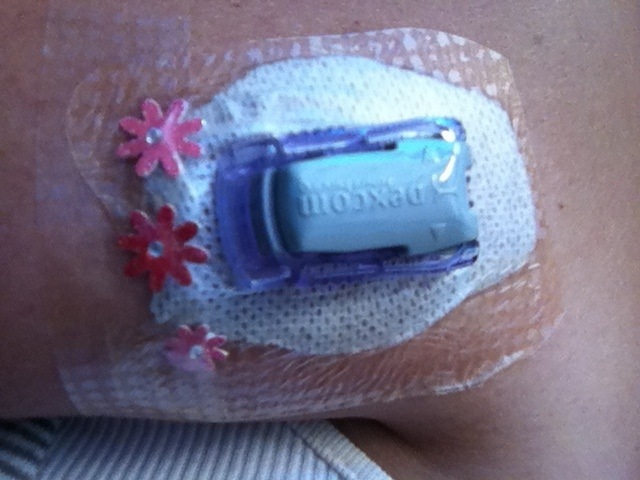 The cannula (tube that goes under my skin) was bent and I got sicker and sicker. I threw-up more than anyone ever should and when I did eventually pee my pants, I wasn’t even upset. Big deal. Babies pee their pants all the time (granted they are wearing diapers and not a knit dress, but hey I had bigger problems). I hesitantly wrote a blog because I realized there are diabetics (especially parents of diabetics) who might learn a thing or two from my experiences. Diabetes gave me something to talk about. What I didn’t quite realize was how nice/encouraging/ stress relieving it would be to expand my diabetes friend circle. Recently I responded to a message I saw on twitter, It was a request to help a little girl with an insulin pump who found out she had to get glasses. She was worried she would be bullied or “not pretty”. Over 50 diabetics responded in a matter of hours and some amazing T1D women made a video of all of us in glasses and with insulin pumps. Regrettably I MAY have overdone my dance moves. The video has been viewed on YouTube a lot (yikes) but its heartwarming to know that I belong to a group a people who would all jump to boost the confidence of one of their own. Diabetes has made me smarter. 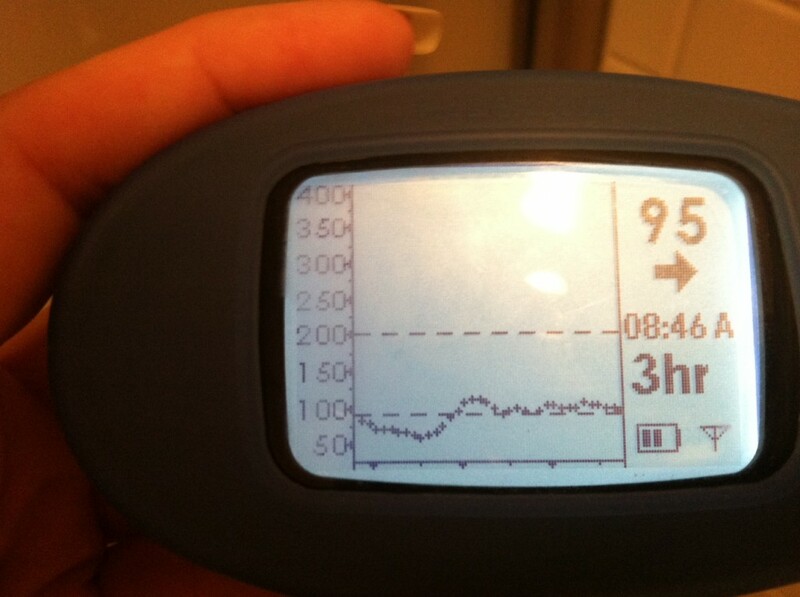 I was bright enough to notice signs I was having dangerously low blood sugars at night. 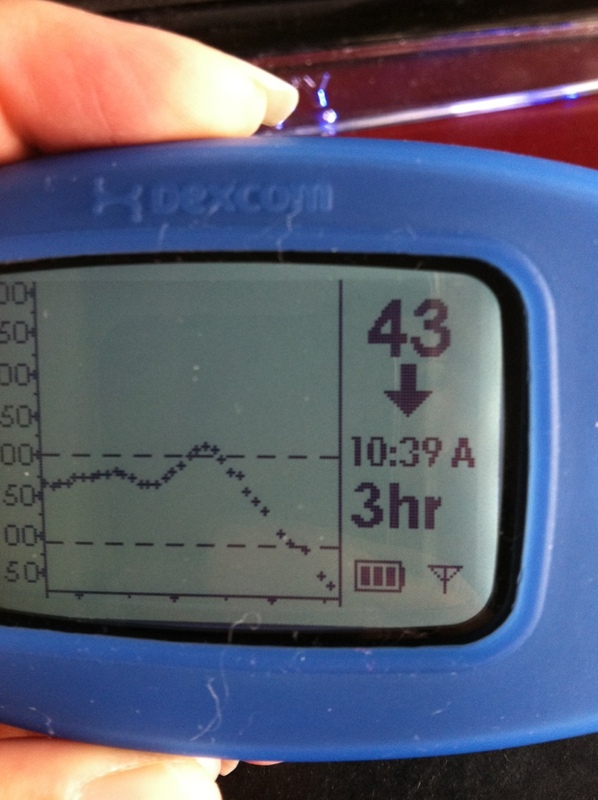 I went to my doctor and told her I wanted a Dexcom (continuous glucose meter). I now know how to take a barbaric looking device, attach it to the back of my arm, and inject a piece of metal under my skin, hook it to a computer chip and get the inserter off me with a bra strap over a doorknob. 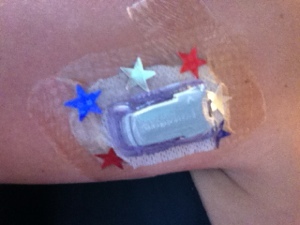 Diabetes has clearly brought out my inner McGyver!